Ever wondered what is the connection between the Butterfly effect, Chaos and Supercomputers? One of the the best ways to describe it can be using climate modeling. Geophysics is a field in exact sciences that tries to describe the physics behind processes we see on Earth (Geo). Examples of such processes can be earthquakes, tsunami, tornado, hurricane, clouds, sprites and more. Sub-Earth (Geology): Understanding the interior of the Earth, predicting earthquakes, volcanoes, geological structures or resource exploration (oil & gas, deposits etc.). You may think of it as ultra-sounding the Earth. Climate Research: Understanding the driving forces behind climate, predicting the past, present and future climate states of the Earth and also for our weekly weather report. Planetary Sciences: Understanding of the formation and evolution of planets in the universe surrounding us. The term exact science can be misleading. A correct interpretation would be that we know how exact our science is. Every measuring device, satellite or instrument used for observations introduces some error, so it is never perfectly exact (we are dealing with nature, in contrast to more abstract fields like Mathematics or Computer Science). Even though not exact, climate modeling is very important to our daily life and preserving human kind: predicting disasters, protecting crops (agriculture), making sure we can plan a trip on a sunny day etc. And of course, better understanding of the Earth. If I were to tell you that a forecast for 3 days from now, would predict weather conditions for Copenhagen (pick the city of your choice) a wind of 40 km/s, directed north-west, it should might like science fiction. In fact, this is what climate modeling is, predicting atmospheric conditions in various parts of the Earth, to a degree of certainty. To make it short, the principles of climate modeling are solving sets of differential equations that govern the way our atmosphere behaves. And yes, trying to take into account all possible factors, like changing sun radiation, moon orbits, ocean termperatures, radiation from land or glaciers, pressure over the earth at different heights, chemical interaction between molecules and heat absorption to mention a (very) few. The more we understand or observe, the more sophisticated the physics becomes. Given all these parameters you can start to figure out why climate modeling is so complex. It should be emphasized, that there is no analytic solution to these equations. An analytic solution is a term we use, when one can find a defined solution based on a formula. For example, Newton’s famous second law: F = ma, given a force F and a body with mass m, we can compute exactly what the acceleration a will be. This is not the case for climate (or aerodynamics); for that we have to use computer simulations. 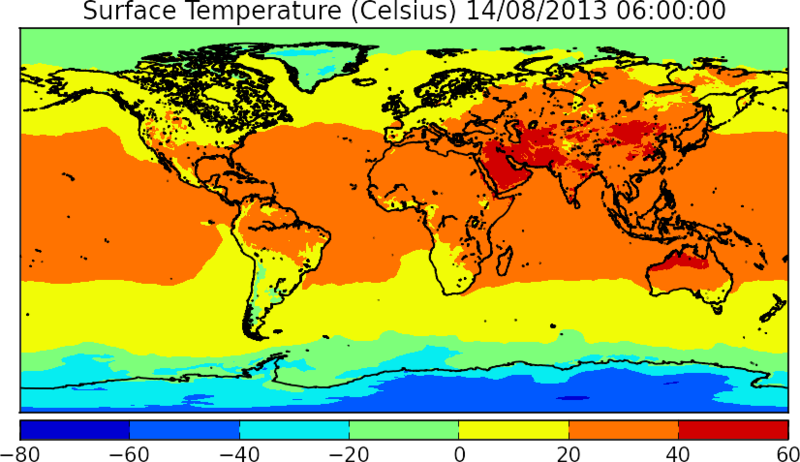 This figure shows global Earth surface temperatures for August 14th, 2013 (Time is given in UTC). You can notice that temperature around the ocean are pretty constant and cold closer to the poles. The equator shows hotter temperatures, whereas desert areas in Asia and northern Australia have a record of 40-60 degrees (Celsius). Back in the 19th century it was shown by Poincare (the full story) that a set of differential equations were very sensitive for initial conditions. As if flying the same airplane during the same time, but a wind change of 0.1%, could lead us to California, instead of New-York. The term was coined back then, but is also attributed to the 1960’s when computer simulations began to take significant place in science. It was quite irritating at first and inspired many scientists afterwards. Climate modeling relies on recurring observations (sending radiosondes on daily basis, satellite and ocean temperature measurements etc.) to predict future climate states. A butterfly is too small for any existing measuring device to distinguish (you would see later why). However, for the chaotic reasons described above, it was considered that a wing-clap of a butterfly can be responsible for triggering a larger atmospheric process we weren’t aware of (A Tornado?). Not so long ago (few decades), weather forecasts could only be given for several days ahead, due to many limitations. With improved observations, physical understanding, more satellites and significant computing power, climate research is very sophisticated and more accurate than before, although known to be incomplete. When defining climate computer simulations, a grid of points is selected to span the Earth. If not a pure simulation, those points are where measurements were performed previously, so we have data to initiate a realistic model with. High resolution simulations are performed with grids where the spacing between points is about 500 m (meters), but these are quite expensive for routine operation. An example to a common real-time weather forecast run by NCEP/EMC is for 84 hours ahead, performed 4 times a day with a resolution of 12 km (Reported here). To make fast calculations, Manhattan, is smaller than a point in the model. Not to mention how many butterflies we can fit into a square of size 12×12 km2. 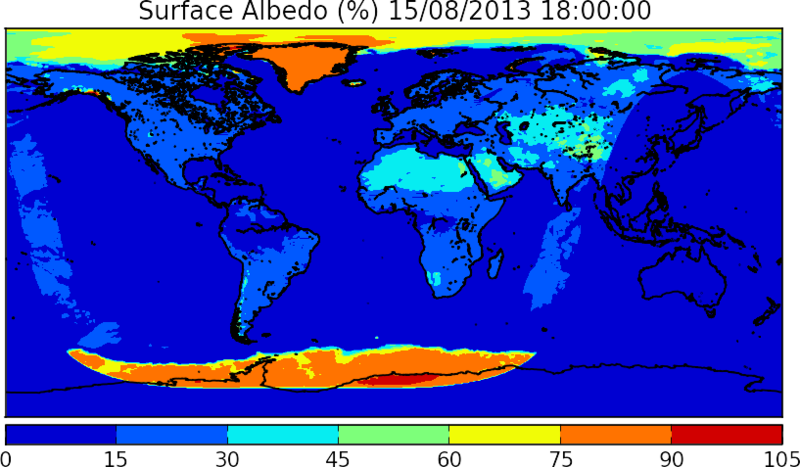 This figure shows global Earth Albedo (%) for August 15th, 2013 (Time is given in UTC). Albedo is the amount of radiation sent by the Earth back to space. The next post will provide more insight into the software scientists use to model the climate and supercomputing perspectives. The figures above were created using real-time data from NOMADS service, operated by NOAA. ‹ In the heart of Europe… the sequel! 2 Pings/Trackbacks for "The Butterfly Effect, Chaos and Climate Modeling"